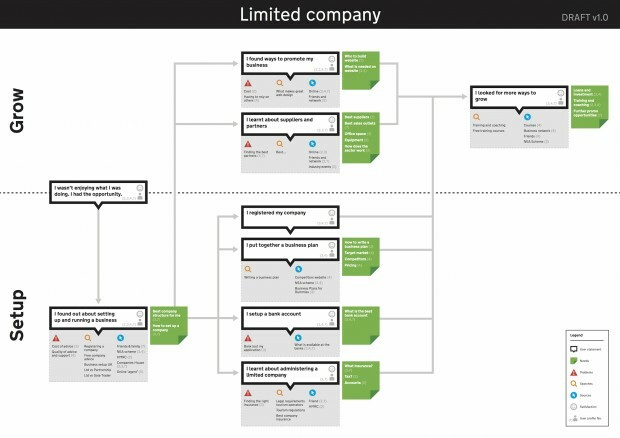 For example, these maps show what the GOV.UK team learned about peoples' experience of setting up a business. To encourage you to create your own maps, in this post I'll describe a simple technique I've been using to research peoples' experience of criminal justice services. Recruit people who've recently had the experience you're interested in. If the people you want to interview divide into clear types - in my case, victims, witnesses, jurors, etc - you should interview at least 4 of each type. If you don't know what different types there are, start by interviewing 8 people. Types will emerge from the patterns in their different experiences. Whatever you do, make sure you recruit a good mix of participants, and not just by age, gender and socio-economic group. You also need to get a mix of circumstances - in my case, different types of crime and different outcomes. Depending on the complexity of the experience, each interview can take between 60 and 90 minutes. You should be able to fit 4 interviews into a research day. During the interview the participants write out these experience mapping cards to capture the key things about their experience: what they were doing, thinking and feeling. Depending on the length and detail of the experience, you'll need 15 to 30 cards per participant. These cards are generic versions of cards created by my colleagues Naintara Land and Pete Gale. They work for most experiences, but feel free to adapt them to record specific things that are important to you. In each interview, start by explaining to the participant that you want to learn from the experience they had and, to do that, using the cards, you're going to work together to create a big picture on the wall of all the things that happened. Then ask the participant to tell you about their experience. Keep them talking until you have a good overall picture of what happened. 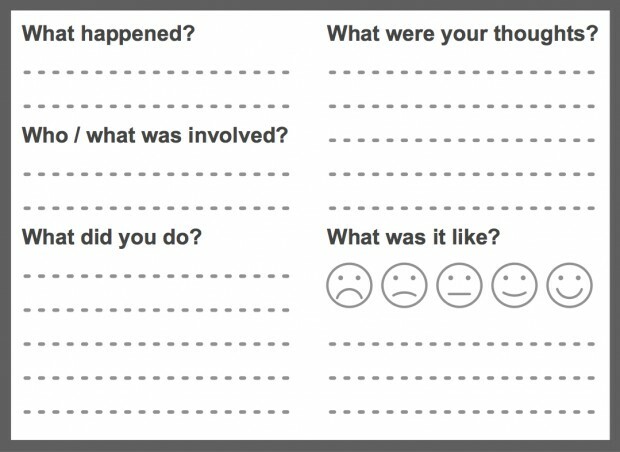 When you have a good feel for what happened, you can pick a place to start (often not at the very beginning) and ask the participant to write a few cards to cover the things that happened at that point. Ask the participant to talk you through each card to make sure you understand it. If they say more things than they've written, ask them to add those points to the cards. Encourage participants to write slowly and clearly. You need to be able to read them later. When you have a few cards, start sticking them to the wall, with time running from left to right. Stack closely related cards in columns. "I called the police. ", "The police came. ", "They cordoned off the area. ", "I gave my statement." would be 4 cards in a column. Encourage the participant to write and explain more cards until they've covered everything that happened. Then ask the participant to look over the map. Does it represent their experience? At this stage they may remember more details. If they do, write more on the cards, or add new cards. Once the map of their experience feels complete, you can also ask the participant how it could have been better for them. 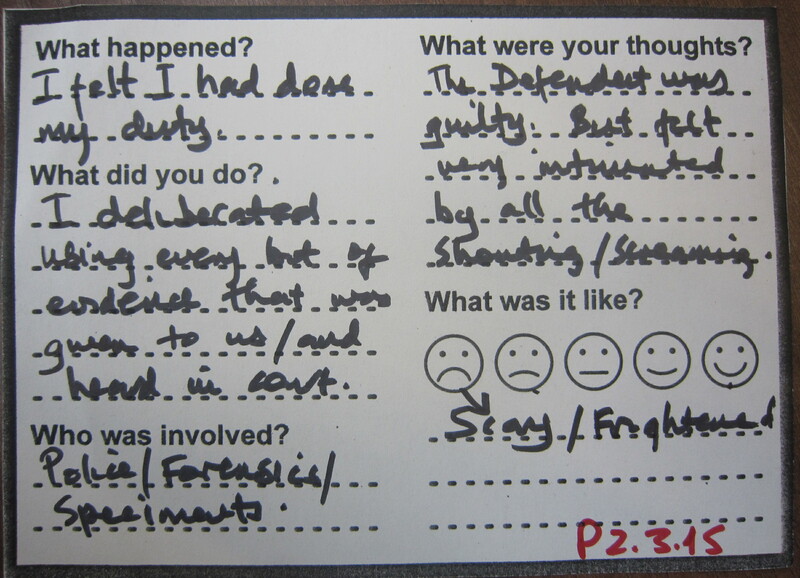 Record their thoughts using a different coloured pen to write "What 'should have' happened? cards. Participants may not have clear ideas for improving your service, but, through explaining how things could have been better for them, they often provide an interesting alternative perspective. After you've thanked the participant and let them go, write a participant number and sequence number on each card and a take photo of their map. Then stack all the cards in number order and clip them together. This will help you analyse the cards, and reconstruct the maps if you need to. 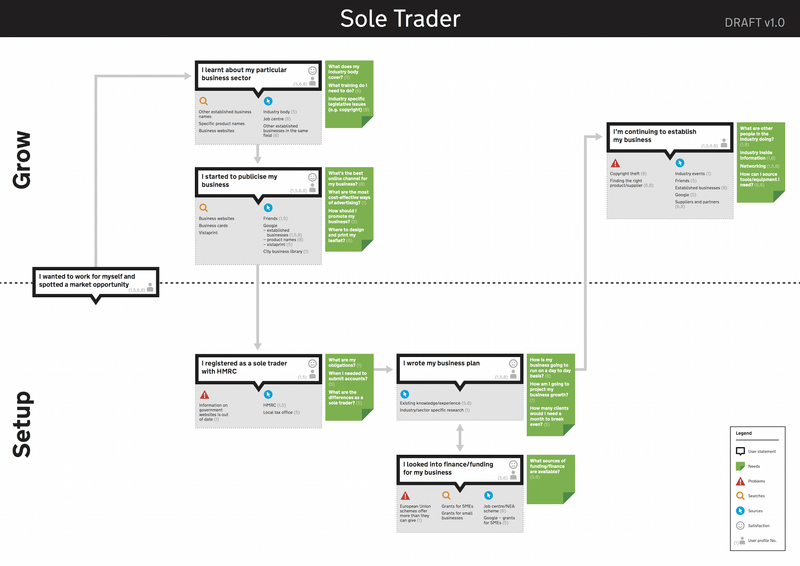 Combining the experience cards with other data (interviews with frontline staff, back office metrics, web analytics, etc) will give you everything you need to create a great experience map. How you do that is beyond the scope of this blog post, but there are some excellent guides available on creating experience maps. My favourite is by Adaptive Path, available from mappingexperiences.com. It provides an overview of the entire process from research, to building and using an experience map. Good luck researching and creating your own experience map. We'd love to hear how you get on using this technique. I love the cards you used for capturing the journey. What size were they? A5 or index card? It's hard to tell. Thanks Audree. The cards I've been using are A5, so two on a sheet of A4. If you're doing a lot of interviews it can be worth getting the cards printed - cheap paper, black and white.